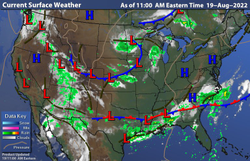 Composite National Current Weather Map. Analysis of current conditions and fronts at ground level. 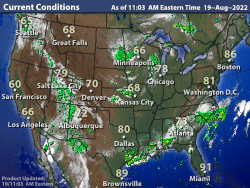 WSI's Composite National Current Weather Map displaying GOES-EAST Infra-red (IR) Satellite, WSI's NOWrad National Radar Mosaic and Current Surface Temperatures in Degrees Fahrenheit for Major Metropolitan Cities. Data is updated hourly to indicate current conditions. Weather most often results from temperature differences from one place to another. On large scales, temperature differences occur because areas closer to the equator receive more energy per unit area from the Sun than do regions closer to the poles. On local scales, temperature differences can occur because different surfaces (such as oceans, forests, ice sheets, or man-made objects) have differing physical characteristics such as reflectivity, roughness, or moisture content. Surface temperature differences in turn cause pressure differences. A hot surface heats the air above it and the air expands, lowering the air pressure. The resulting horizontal pressure gradient accelerates the air from high to low pressure, creating wind, and Earth's rotation then causes curvature of the flow via the Coriolis effect. The simple systems thus formed can then display emergent behaviour to produce more complex systems and thus other weather phenomena. Large scale examples include the Hadley cell while a smaller scale example would be coastal breezes. The strong temperature contrast between polar and tropical air gives rise to the jet stream. Most weather systems in the mid-latitudes are caused by instabilities of the jet weather. Weather systems in the tropics are caused by different processes, such as monsoons or organized thunderstorm systems. Because the Earth's axis are tilted relative to its orbital plane, sunlight is incident at different angles at different times of the year. In June the Northern Hemisphere is tilted towards the sun, so at any given Northern Hemisphere latitude sunlight falls more directly on that spot than in December (see Effect of sun angle on climate). This effect causes seasons. Over thousands to hundreds of thousands of years, changes in Earth's orbital parameters affect the amount and distribution of solar energy received by the Earth and influence long-term climate.